About half a year has passed since the last detailed news for Mother 3. Now leading graphic designer Benimaru Itoh talked about one of the first 64DD games. As we reported in an earlier issue (TOTAL! 4/97) Mother uses the writing capabilities of the Nintendo Disc Drive at its fullest. 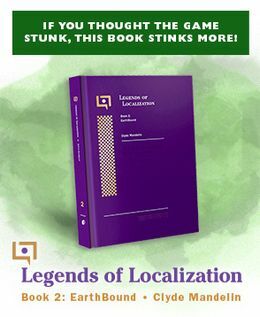 Examples include saving the permanent location of items left elsewhere (PC gamers may know something like that from games such as Ultima VI), but you won’t always find these items as when you left them. A seed for example may grow to a beatiful tree and meat leftovers could attract evil monsters. The internal clock of the 64DD is responsible for alter the world in real time even when the console is turned off (or it may calculate the changes as soon as the console is turned back on). Through these (and many more) programming techniques project leader Shigesato Itoi (who also produced the two prequels) wants to guarantee that every playthrough will be different. Aside from different main storylines there are endless sidequests which shall make the game as unpredictable as reality itself. At last you’ll be able to play through an RPG two, three or four times without being bored. The story is set in a timespan of ten years spread out over twelve chapters. There will be ten playable character but the main actor is not always the same person. The most important hero of one chapter can be a small, innocent baby at a different point in time. The programmers have also want to set a trend in a graphic kind of way. Where Toy Story dictated the style for 3D computer animated movies Mother 3 shall revolutionize the style of movie-like 3D games. By looking at the pictures (and Mr. Itoi’s love for America) you’ll notice several similarities to Lucas Arts’ Day of the Tentacle (Maniac Mansion 2). The characters and sceneries look all kinds of colorful, cute and crazy. As with other RPGs the screen will change to a battle screen when coming in contact with an enemy. But the monsters are also visible on the overworld map and won’t surprise and duel you (like in most of the [F]inal Fantasy games). In contrast to the prequels Mother and Mother 2 (or Earthbound in the USA) Mother 3 won’t be set in a fictitious cliched world of TV America (like japanese Itoi saw it) but instead it offers a mixture of fantasy, science fiction and the Middle Ages. The game is still tied closely to the ending of it’s prequel so there is a given coninuity for everyone in the know. There will be a definite release for the USA and with the introduction of the 64DD there will surely be a ‘third mother’ even for us German speaking people. Mother (left) for the NES was a success in Japan only (because it was only released there anyway). Mother 2 (right) for the SNES was released in the USA under the name Earthbound. Mother 3 will hopefully get a release in Europe, too. Oh, how cute! This band shows us their little dance at the game’s start. All characters, sceneries, towns and even emotions are being drawn as sketches so that the graphic designers have clear requirements of what the visual style of the game should be. The desert is full of life. Most of the time it’s sadly that kind of life you don’t want to have anything to do with. It won’t be easy to infiltrate this military camp, if you’re not disguised. Mother 3 also knows the cold season. Items you left there won’t be so easy to recover. If you have a mother you got lots of butter. In this sketch of a forest you are able to recognize the intended mood really well. I actually don’t seem to recognize that dev art on the second page that has a Mr. Saturn hut-like building among the trees. I wonder how many pics and such we still haven’t seen. Awesome article. Learning about all this information about EarthBound 64 just makes me feel sad that we didn’t get the original incarnation. It probably would have been the most epic N64 game ever released. At least we got the GBA version in the end, but the N64 version seemed have promised so much more than M3 on GBA ever did! I hope we learn more about EB64’s development in the near future. Kind of sad how big the plans were for the 64DD. It is funny to see they were also talking about Super Mario RPG 2, thinking that Square was involved (I assume they were saying that, anyways. I don’t know German). Two lost/transformed titles in one place! 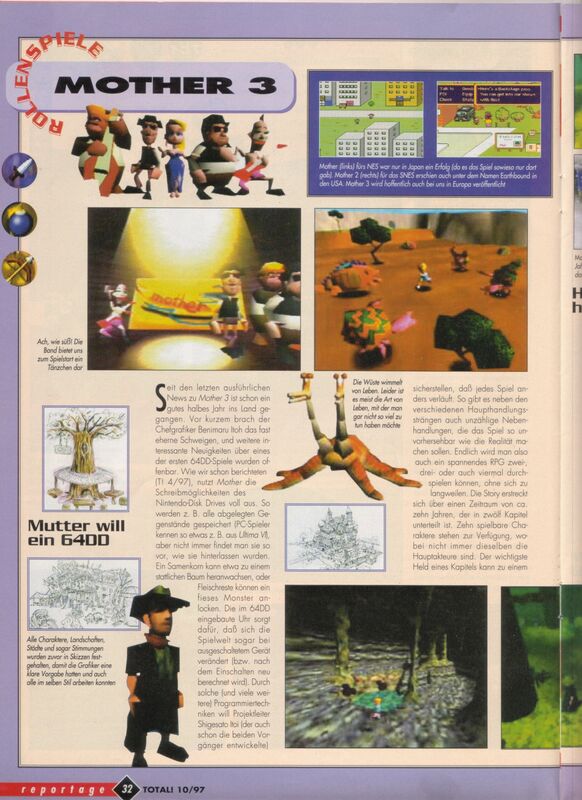 I also want to point out that there was an earlier issue of that magazine with yet another EarthBound 64 preview (issue 4/97). If any German lurkers read this and you have this issue: Please scan the article. I am in desperate need of that! Christ. I see tons of articles (and the 2 videos) about how EarthBound 64 was going to look awesome as f*ck, and I get fans that say “oh, GBA Mother 3 is SOOOOOOO much better!! !” Really. Find the cartridge of it, or better yet, have a fan make Mother 64 from the ground up using the Mario 64 engine, but really, you fanboys need to face the fact that you HAVEN’T PLAYED THE GAME YET. V-King, please do! It’s great to see these type of things. That’s not entirely true. Mario RPG 2 is actually Paper Mario. They changed the name later during the developement. About the Pokemon article, it talks about two games for the N64, one action game and one RPG. The action game could be the first Pokemon Stadium (the one only released in Japan), the RPG… I dunno. Maybe they got it confused with Pokemon G/S. I can’t say anything about Ogre Battle, never was interested in it. V-King, get one of the treehouse on the far left side. I don’t recall that one, either. Oh. And also the valley/bridge that Lucas’ model is covering. Wow, on the very right side theres something about pokemon for the DD and Super mario RPG 2. would have loved to see something like that. Super Mario RPG was the last product of the fruitful collaboration between Nintendo and Square. As a complete surprise both companies announced back then that they had developed a 3D adventure with Mario in the leading role that would soon come to market. Unfortunatle, both companies were unable to agree on a joint business plan, so Square left the Big N in the dust as it chose to develop for Playstation. This is also the reason that SMRPG didn’t make it to Europe. The follow up would be developed exclusively by the Big N for 64DD. 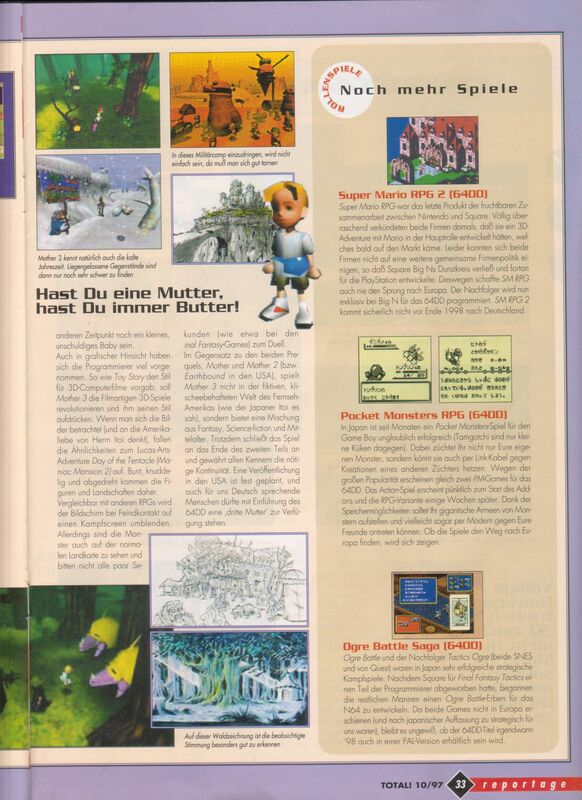 SMRPG 2 definitely won’t make it to Germany before the end of 1998. In Japan, for months the Pocket Monsters game for Game Boy has been an unbelievable success(Tomagotchi is a baby chick in comparison). You don’t just raise your own monsters, but with the Link Cable you can battle against the creations of another trainer. Because of the huge popularity, two PM games have simultaneously shown up for 64DD. The action game appears with the release of the system and the RPG variant a few weeks later. Due to the great storage capabilities of the system it should be possible to set up a gigantic army of mosters and maybe even go against your friends via Modem. Ogre Battle and its sequel Tactics Ogre(both SNES games from Quest) have been very successful strategy fighting games in Japan. After Square enticed a number of the programmers for Final Fantasy Tactics, the rest began to develop an Ogre Battle for the N64. Since both games haven’t shown up in Europe (and from what the Japanese perception of strategy games for us) it is unclear if the 64DD titles will sometime in ’98 also be available in a PAL Version. hmm…why do I see a glimpse of Ness/Ninten at the left upper corner pic of the second page? 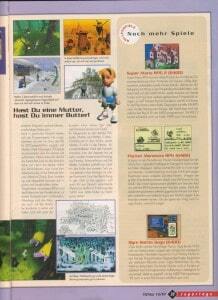 And to the right of 2nd page:Super Mario RPG 2, Pocket Monsters RPG, and Ogre Battle Saga, all for 64DD…how ironic..